Whatsapp has just released a new version of its App for iOS users, which allows you to Send Offline messages even when your data connection is turned off. We are still waiting for Whatsapp to rollout the long awaited Edit and Unsend features, which i think will allow you Edit your sent message and/or Unsend sent message on Whatsapp. For example, if you want to send a message when you're offline, you can write it and tap the Send button. Though the Messages will be queued up and sent when you switch your data connection ON. >> Redesigned storage usage screen that lets you manage your phone's storage space by clearing certain message types, like videos, from specific chats. You can see this option in Settings ==> Data and Storage Usage ==> Storage Usage. >> Send up to 30 photo or videos at once now. If you are using iOS, go straight to itunes market and update your WhatsApp to the latest version v2.17.1. Have you updated your Whatsapp for iOS to the latest version? How to send offline messages on Whatsapp for iOS. 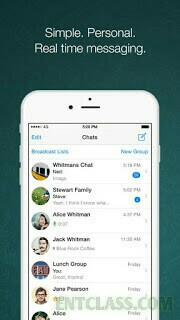 Download Whatsapp for iOS. Send messages on Whatsapp when data is turned off.